John McEnroe wants desperately to see Nick Kyrgios realise his potential but what he saw up close commentating for Nine on Tuesday night was the continuation of his sad decline. Kyrgios competed for the first nine games of his 6-4 7-6 6-4 loss to Milos Raonic. After that, save for one of the biggest first serve weapons in the game and some freakish talent from the back of the court, he would have finished his campaign with an embarrassing scoreline to more appropriately match his demeanour. As he watched Kyrgios getting attended to by the trainer at the end of the first set, McEnroe asserted that the 23-year-old was “like a kid, he just wants to show people that he's hurting to give him an out and then maybe the other player lets his guard down”. His right knee no doubt was genuinely troubling him but what puzzled McEnroe was his willingness to show his opponent weakness when so many other players hide their injuries and vulnerabilities for as long as they can. Kyrgios has never wanted to be a brawler like Rafa Nadal or a fighter like John Millman. Just last week he admitted to the media that he would be a considerably better player if he could borrow just a trice of Millman’s appetite to compete. "If I had one per cent of what John could do every single day - training 100 per cent, ticking all the boxes - I'd probably be much more of a player than I am right now," Kyrgios said. "But I'm still working on it." How hard he’s working on it is a difficult question to answer. Giving further insight into what McEnroe sees in Kyrgios, the seven-time grand slam winner alluded to a stubborn belief in himself and his methods that fails to take into account the experience of others. “He's very analytical, he's very smart so he has a tendency to dismiss people in a way, quickly. But he likes people around him ... he'll question you but it's very difficult for him to buy into it,” McEnroe said. In other words he has some understanding of what he needs to do to achieve greatness but he simply doesn’t want to. That’s another trait that could be described as childlike. With all his showmanship, the running commentary and the trick shots, Kyrgios has always been more of a stage performer than a competitor. Give him any kind of audience and he’ll play up to it, shifting his focus from the point by point grind to the search for a crowd pleasing highlight. Next to McEnroe in commentary, Todd Woodbridge was audibly frustrated by Kyrgios’ shot selection and both were at times baffled by his court positioning, often forced to dig out half volleys by only half committing to the net when he would have been better served staying all the way back or going all the way forward. At one stage when the match was still up for grabs deep in the second set, Kyrgios brilliantly grafted his way back into a point to rip the ascendency from Raonic only to hand it straight back again by playing a behind the back shot that begged to be hit for a winner. There were plenty of tweeners as well, more often than not when the point was on his racquet. He performed them seemingly out of boredom rather than necessity. All this can of course be explained, at least partly, by the way Kyrgios trains. On Sunday this reporter watched two practice sessions. First it was 20 minutes of Nadal; next it was 20 minutes of Kyrgios. To call them chalk and cheese would be one of the great understatements. Nadal’s was just as intense and serious as his matches. He was grafting and sweating and thumping his trademark forehand. The attending media were treated to five games, Nadal serving then returning, and his hitting partner won just a couple of points in total. A couple of hours later on a court just a stone’s throw away it might have been a different sport. Kyrgios spent more time in his chair than on the court and once he started hitting with his good friend Matt Reid it was beyond casual. At one stage Kyrgios finished a rally with three tweeners in a row. 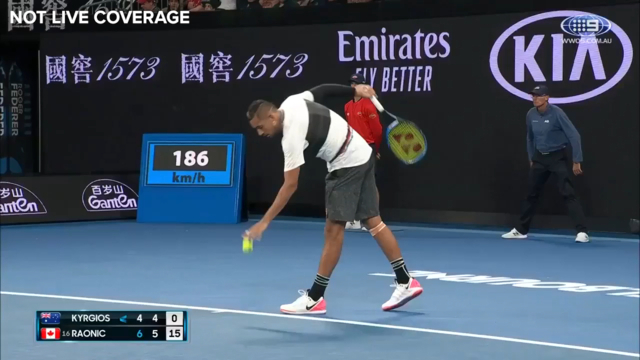 There were plenty of laughs too, so no doubt Kyrgios was having fun. But genuine preparation to play a best of five set match against the world number 17 who has one of the biggest serves of all-time? Absolutely not. So when commentators and Aussie fans are frustrated watching Kyrgios, it comes from a good place. The frustration is born out of his extraordinary gifts and his brief history early in his career of putting together deep runs in grand slams. Now it seems like he spends more time on excuses than on mounting a serious quest to be Australia’s first man to win a grand slam since Lleyton Hewitt almost 17 years ago. Certainly excuses came in his words and his actions as he flitted between searing winners and random drop shots; between generously applausing Raonic for his winners and chastising himself and his players box, with the odd racquet throw and ball whack thrown in for good measure. By the time he lost the second set tiebreak it was clear that in his head the match was over. Thirty-eight minutes later, many of them featuring more Kyrgios showtime and it was. For now, so it seems, so too are Kyrgios' ambitions of a serious tennis career.